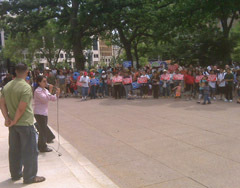 Proponents of drivers cards for illegal immigrants call on state Senate leaders to restore that language to the budget. Madison police officer Carlos Valentin says it&apos;s an issue of safety. "For a lot of citizens – or a lot of inhabitants of this state – driving on our roads is a necessity," Valentin says. "Not having identification is so problematic in law enforcement, because it just simply does not aid us in trying to know who we&apos;re dealing with. The drivers license certificate would cover that, because it would serve as a form of identification." The state Senate pulled the language for the cards from its version of the budget last week, and Christine Neuman Ortiz with Voces de la Frontera says Milwaukee Democrat, Senator Tim Carpenter, is the reason why. "We are here today, and many of his constituents are here today, to meet with Senator Carpenter . . . to basically tell Senator Carpenter that he is misinformed." But in a statement , Carpenter said his constituents overwhelmingly oppose driving privileges for illegal immigrants. Neuman Ortiz is with Voces de la Frontera said pressure needs to be put on Carpenter and Senate leadership. "They have the opportunity to stop preventable deaths, to stop preventable accidents." Valentin, the Madison police officer, said immigrants would have to show proof of drivers education and insurance to procure the cards, thus making the roads safer for all. Meanwhile, Governor Jim Doyle was indicating he&apos;s more interested in seeing budget language that would allow children of immigrants to pay instate tuition. "What&apos;s ten year-old kid supposed to do? Say, &apos;I&apos;m sorry mom and dad, I&apos;m going to leave you and walk home to Mexico?&apos; What these kids have done are study, study hard and done well in school. I hope we&apos;ll join those states that at least allow them to have instate tuition," Doyle said. The provision was on which Doyle had included in his original budget proposal, while the license certificate language was added by Democrats, during the Joint Finance Committee&apos;s budget process.